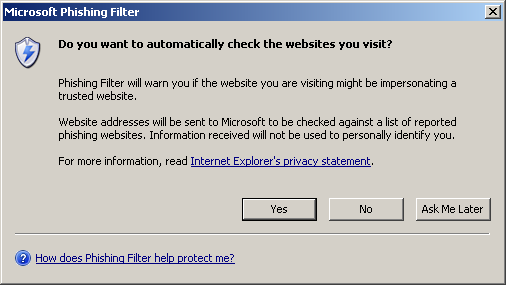 Hmm, IE7 should result in some heated discussions. I'm sure they won't collect the data you send them, but some people will obviously hate that the information is sent to Microsoft. Still, they don't have to run it if they don't want to. Sometimes I really don't understand Partition Magic. It's a great piece of software, but I hate when it tells me I need to restart my computer for it to carry out the list of operations, but if I were to do them individually it's more than happy to do everything from within Windows. All I wanted to do was make a data partition smaller and create a new partition in the free space, but I've had to do it one step at a time. Looks like you can get a beta of IE7 for Windows XP, apparently it has an anti-phishing capability, which basically compares the URL you're visiting against a list of known phishing scam sites. Hopefully this means there's a list that's held locally on the PC that gets automatically updated (similar to how the Netscape browser does it to determine which internal browser is used), otherwise the privacy people are going to go nuts if every URL you visit can potentially get logged by a MS server. I just realised that Isla Fisher is in the film Wedding Crashers, I met her at a trade show at London's Olympia a few years back and I should have her autograph somewhere. She was nice and pleasant, and incredibly beautiful (why on earth she's going to marry Sacha Baron Cohen - aka Ali G - I have no idea). I only managed to have a quick chat with her in the press room before she ran off to one of the stands (wearing the world's shortest dress). She plays one of the sisters, along with Rachel McAdams (Regina in Mean Girls - not sure how she managed to get away with playing a teenager), despite only being 8 months older in real life. McAdams looks different (and by that I mean a lot better) with brown hair, but apparently has a boyfriend in the film played by Bradley Cooper (Will from Alias). I hear Vince Vaughn is on top form again, I can't wait to see it! For a while now I've been annoyed that the quick and dirty way of opening up MPEG files (using DirectShowSource) with AviSynth 2.5 would inevitably lose the audio, but it seem that decent audio support has been brought in with 2.53 (I was still on 2.52 from ages ago), so I've jumped straight to 2.55. Now, for example, I can crop the black bars at the top and bottom of MPEG files without having to re-encode the movie, so I can watch it properly on my widescreen monitor. Yet again, if I bother to Google things that bug me, I can usually find a simple solution! I've just realised that I've only sent 15 emails in the last 6 months. I use instant messengers so often to chat with people that there really is very little need for email anymore. Out of those 15, 3 were quick replies to one friend, 3 were lengthy replies to someone about CDex, and 3 were replies about jobs vacancies that I'd been emailed. One was when I was trying to get some form of customer service from Aria, eventually I called and waited ages on the phone to find out why my order had been delayed. When so much of my email is spam, I sometimes have to wonder why I even bother with an email address. I still remember when email was written e-mail (obviously, short for electronic mail). Longhorn is no more, it's officially going to be named Windows Vista, although I do think Longhorn is/was a much better name. Had a really nice chicken madras last night, spicy, tasty and really hot. Just finished a really yummy chocolate pancake for lunch. Thought I'd settle into the villa with a nice cup of coffee and watch some TV, not sure why it's so bad, probably the milk, but possibly the sugar. Could really do with a nice one from work. I've fiddled with Windows enough to know that you can mount partitions inside empty folders on NTFS partitions, so I sort of knew you could do symlink-like things (just like symlinks in Linux). I don't know why I never used Google before, and I was amazed to see that you can either use the Windows 2000 Resource Kit to do the trick, or you can use this lovely freeware application called Junction Link Magic, which I've just used to do some tidying up - all the warnings do seem like overkill for an application that appears to work perfectly. I now have several folders from several drives inside a single folder. This has made my day (I'm easily pleased)! Apparently you can get tools to create links to files, rather than just play around with folders, but I'm more than happy with this. Just found this on Watch With Kristen: "I got my hands on a very early, preliminary rough (did I mention not final?) script and can tell you the original (not-set-in-stone) plan: Season five starts off in a foreign land, where our man Jack has been hiding. Time has passed, and he has a new hot little squeeze who has a 15-year-old son. And there's a devastating terrorist bombing that brings him back into the fold with CTU"
She also said Don't let the fact that it stars the girl from NBC's god-awful Committed fool you. Close to Home is arguably the best new crime drama of the season. It's got heart, which gives it a Grey's Anatomy feel, and Jennifer Finnigan's portrayal of a new mom and agressive prosecutor seems destined for Emmydom. The man behind this strong woman? Angel's evil Lindsey, aka Christian Kane. "I put the guns and the swords down, and I'm holding a baby now, so it's a little awkward," he tells me. "My biggest job now is just understanding that my wife's gonna be working late. I get home before she does, and I have to take over the job of almost Mr. Mom." Probably the worst virus in 2005, this has many variants. Mytob is one of the most advanced worms seen so far, and virus writers can easily modify the source code to develop new variants. The Netsky variants have finally been knocked off the top spot, Mybot now makes up something like 42% of reported viruses. This family was introduced during March 2005, and there's roughly one new copy per day. It is stealth-like and can hide on an infected PC while lowering security settings. It typically appears as an official message from an email administrator (which can be blocked with proper email rules). Some Mytob variants can exploit unpatched Microsoft security vulnerabilities (although sensible people will be patched). In short, it's evil. Keep your software up to date and cross your fingers, hopefully this one will die down soon - when users finally learn not to open everything that's sent to them! Not sure why, but I had this Fatboy Slim track stuck in my head earlier. I had a play with Telewest's new Teleport feature, got to watch Eastenders and Holby City from earlier in the week. And you can fast forward/rewind/pause it from the remote (which already has the labels, so they've obviously planned this for quite a while). It's sort of like Tivo, but they control what you can watch later, it only lasts a week, and it's their hard disks that store it. I think I like it. I just installed the demo, and was a little surprised that I was forced to enter a company name. I can't think of many companies that would buy it and/or condone playing it at work. Caught it off my brother, but so did the rest of the family. Also, my new monitor was supposed to arrive today, but I still don't have a consignment number. Or a reply from Aria yet as to where my order is. I decided to get a brand new monitor. There's nothing wrong with my old 17" one, but I'm going for a nice 20.1" widescreen one from Dell. Great for watching DVDs.